Kudos to Dr. Shah Alam Khan for such a beautiful review of the film. It one of the best literary pieces on films I have read and wanted to preserve it here at the Center for Pluralism and the blog https://MikeghouseforIndia.blogspot.com. The cozy and comfortable chairs were a delightful respite from the humid heat outside. Radha sat next to me in that dark hall as Saadat Hasan Manto emphatically reverberated, “My stories are a mirror for the society to see!” And next to Radha sat Saugandhi, the prostitute (from Scorned) who loved her job. The Pathan saheb who looted the red thermos sat in the front row; Mozel, the Jewish girl who rented a flat in the Advani Chambers was sitting next to him and so was Ishar Singh, who sat clutching his neck exactly where a neat line of blood had clotted. A peeved Khaled miyan sat restlessly in Mumtaz’s lap. There was Babu Gopinath and yes Sirajuddin too, (of course minus his Sakina). The post office clerk and the short story writer Joginder Singh sat in a lonely corner with his wife Amrit Kaur; Toba Tek Singh refused to sit and stood in front of others. And there were many more who had sprung out of Manto’s pages of ravishing creativity of angst. They all sat with me as I watched Manto in a posh Delhi multiplex. What do you expect when you go to watch a movie based on the life of your favourite author? A delightful story with intricate details of his life? Or perhaps the revelation of secrets of his life we never knew – that clandestine affair, that one fetish, that missed opportunity. Fortunately, this is what Manto is not at all about. 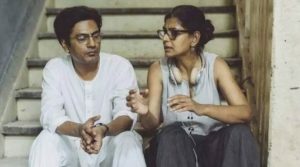 Director Nandita Das has neither spilt any beans, nor are there any moments of truth which we didn’t know about this great writer, but yet Manto is as beautiful and as poignant as a sunset. There are no conformities to the essentialities which are required in film-making and the narrative has been kept simple yet powerful. Das has bracketed the story of the great writer within two of his stories, one each at the beginning and the end. The absolutely beguiling acting by Nawazuddin Siddiqui makes it not only a movie worth watching but also one worth remembering, like the scented memory of your first love. The timing of Manto couldn’t have been better. We are living in interesting times (I consciously refrain from using the word “dangerous” instead of “interesting”). In these interesting times of collective amnesia, it is important that we are shaken up now and then. We need to be jolted to breathe, else the festering wounds over our bodies will rot further. The prejudices of our past have started to rule our present with a deadly assault on our liberal thoughts, and who better could Das have selected to make a movie on but the man who is not only a master of realism but also a gifted rebel, the antithesis of the very society he lived in. I doubt whether Manto can be conveniently called a liberal – he was much more than that. Calling him ‘liberal’ would be insulting his legacy. He was like his stories – truthful, simple and brutal. Strangely enough, he wasn’t a Sartre, neither a Marx and nor a Spencer. It’s equally cruel to compare him with other greats of short story writing like Nikolai Gogol. He was just Manto. His oblique descriptions of sexuality, his love for the wretched of the land, his derision of collective morality, and his savage narration of post-Partition violence with no holds barred is what was unacceptable to the people of his time, including the so-called progressive writers, as the movie depicts at multiple points. Of particular note in this respect are the court scenes where the author defends himself against the charges of obscenity for his story Thanda Gosht (Cold Meat). In fact, there are points in the movie when you, the Manto admirer, hallucinate that Nawazuddin Siddiqui is Manto. A feeling when you transcend with Das’s story and direction into a time zone which surely does not belong to this era. To enter into the mind of the great writer and to make the audience travel with you through the alleys of his thoughts is something which is commendable, and which Das and Nawazuddin have done with the patience of a skilled craftsman. They have explored the reality of fiction like few others have. Fiction is made from the clay of reality and reality is made of layers of truth and untruth. Good writers pick both truth and untruth to weave a story, but great writers like Saadat Hasan Manto pick the threads of truth from reality and weave stories and this quality of the great man has been sacredly preserved and beautifully painted in Manto. No wonder the wordsmith feels offended by the testimony of Faiz Ahmed Faiz refusing to accept Thanda Ghost as a worthy piece of literature during his trial. Credit also goes to the other members of the team who made this movie possible, in particular, Rasika Dugal, who charms in her role as Safia, the caring and at times cavil wife of Manto. Her frames with Siddiqui were a treat to watch. The brisk character of the great Ismat Chugtai and her relationship with Manto was something which stood out as a happy celebration of two of the subcontinent’s greatest writers. Her addressing him as ‘Manto, my friend and my enemy’ in a letter was a moment of literary history for me. A good movie is one which can present its characters in a polychrome, with each shade revealing every aspect of the imagined. In the case of Saadat Hasan Manto, it was essential to maintain this sensitivity of shades. Das’s ability to narrate the sensitivity of Manto, the human being, separately from Manto, the writer, is something which is worth a mention. Him narrating a story to his younger daughter and his arrogance at the office of a magazine are the two poles which Das has wonderfully justified. In fact, the movie reconciles both aspects of Manto, something akin to the Fritz Perls’ concept of ‘gestalt’ – when an individual has the capability to acquire meaningful perceptions in an otherwise chaotic world. It seems that Das and her team had that ability even when they were surrounded by the chaos of Manto’s disruptive stories. We are lucky to have filmmakers like Das and actors like Siddiqui, not because they can write good stories or act well but because they can make movies which leave us provoked and hence vulnerable. Proponents of existentialism say that there are constructive means against fear, but no such means exist against angst. Manto, in my opinion, is a means against angst. Let’s put our hands together to compliment the team of Manto and to compliment the king of words Saadat Hasan Manto himself. It took 63 years for someone to consider Manto as a subject worth making a movie on; we never know if there would be a chance in future for another movie on Manto in this sub-continent because as Jean-Paul Sartre has once said, we are the future to ourselves. And we, unfortunately, know what future we are becoming. Shah Alam Khan is a professor of orthopaedics, AIIMS, New Delhi, and the author of Man With the White Beard. Views expressed are personal.